Background: The genus Lactobacillus has recently been the focal point of researchers due to their ability to produce secondary metabolites with antimicrobial effects. Objective: The aim of this study was to identify vaginal Lactobacillus sp. by analyzing 16S rRNA gene sequence, to investigate into antimicrobial activities of secondary metabolites produced by these isolates and to determine the quantities of lactic acid, acetic acid and hydrogen peroxide in secondary metabolites using High-Performance Liquid Chromatography. Methods: Antimicrobial activities of secondary metabolites were investigated against test microorganisms using Agar Well Diffusion and Agar Spot Methods. Results: According to the results, 18 L. crispatus, 17 L. gasseri, 5 L. jensenii, 4 L. vaginalis, 3 L. fermentum, 2 L. coleohominis, 1 L. saerimneri, 1 L. reuteri, 1 L. johnsonii and 1 L. helveticus were identified. Isolates were frequently found to be effective against Escherichia coli ATCC 25922, Pseudomonas aeruginosa ATCC 27853, Klebsiella pneumoniae RSKK 578 and Bacillus subtilis ATCC 6633. None of the isolates showed activity against Staphylococcus aureus ATCC 43300, S. epidermidis ATCC 12228, S. epidermidis ATCC 35984 and Candida albicans ATCC 10231. Secondary metabolites of all tested isolates contain hydrogen peroxide between 7.306 and 0.33 µg/µL range. Conclusion: It was found that the secondary metabolites of some isolates contained both acetic and lactic acid, while some of them contained either acetic or lactic acid. 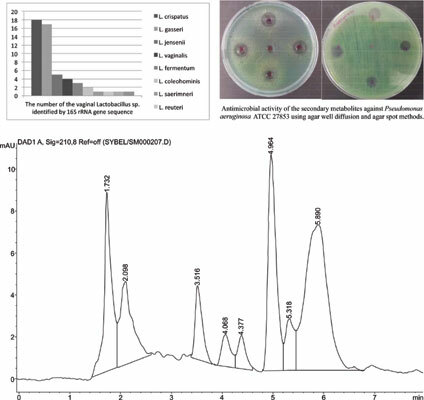 Antimicrobial activity, Lactobacillus sp., secondary metabolites, vaginal flora, high-performance liquid chromatography.